The highlight reveal for many at last night’s Spike Video Game Awards was the latest look at BioShock Infinite from Irrational Games. The minute-long montage set to the sounds of a female singer’s take on the gospel hymn “Will the Circle Be Unbroken?” doesn’t reveal much of anything in the way of new game content, but that doesn’t mean it’s not a well-cut trailer. The clip flashes through a series of looks at the game’s floating, alternate world city of Columbia. You’ll catch sight of Elizabeth, the game’s distressed damsel, more than once and a few behind-the-back views of a younger man who I’m guessing is protagonist Booker DeWitt. Eagle-eyed viewers might notice a slick looking first-person pounce attack that uses the game’s transportation-focused Sky-Hook as a weapon. There’s also a brief flash at the end of the trailer of some monstrous robot suit with a man’s bald head sticking out the top of it. Don’t look for rhyme or reason here. Just watch the pretty colors unfurl and let the experience wash over you. 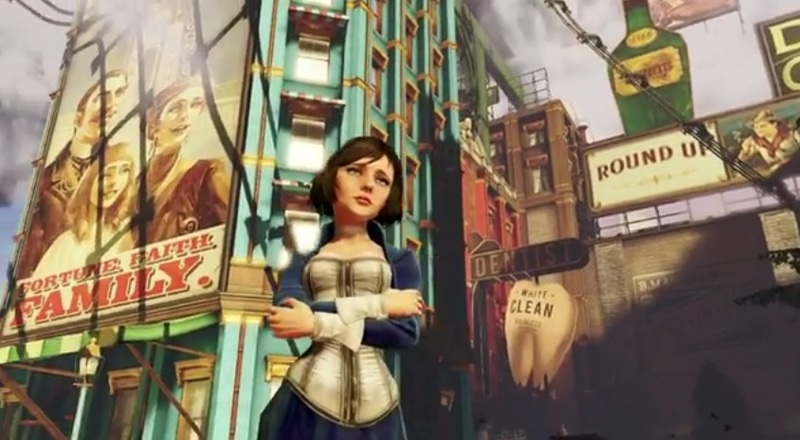 BioShock Infinite is due for release late next year, so expect to hear more soon enough.